1980: On March 15, Congressman Carl Vinson became the first person in the history of the United States to witness a launching in his honor. 1982: USS Carl Vinson is commissioned on March 13, 1982. 1983: After extensive work up and sea trials, the ship with a crew of almost 6,000 Sailors departed Norfolk, Va., on March 1, 1983, and embarked on an eight-month around the world cruise. Carl Vinson steamed in the waters of the Caribbean Sea, Atlantic Ocean, Mediterranean Sea, South Atlantic and Indian Oceans, South China Sea, East Sea/Sea of Japan and the Pacific Ocean en route to its new homeport of Naval Air Station Alameda, Calif. On Oct. 28, 1983, Carl Vinson sailed under the Golden Gate Bridge for the first time as it entered San Francisco Bay. 1984: Carl Vinson received the highest marks ever awarded an aircraft carrier during an operational readiness examination in February. In March, the ship and crew became "San Francisco’s Own" in a formal adoption ceremony. In May, Carl Vinson participated in RIMPAC ’84, a multi-national exercise involving ships from nations which "Rim of the Pacific" including Canada, Japan, Australia, as well as the United Kingdom. On Oct. 14, Carl Vinson began a seven-month Western Pacific deployment. 1985: From early January to mid April, Carl Vinson was deployed in the Indian Ocean for 107 consecutive days at sea operations. The carrier received its first Meritorious Unit Commendations for operations conducted from November 1984 to May 1985. In February, the Chief of Naval Operations named Carl Vinson as the winner of the Admiral Flatley Memorial Award for operational readiness and aviation safety for 1984. 1986: In May and June, the ship was involved in a series of high-tempo operations that included RIMPAC ’86 exercise. On Aug. 12, Carl Vinson deployed on its second Western Pacific/Indian Ocean cruise and it’s third deployment in all. During transit west, Carl Vinson became the first aircraft carrier to operate in the Bering Sea. 1987: After conducting extensive operations in the Indian Ocean and North Arabian Sea, Carl Vinson transited the Bering Sea once again in January. During the transit to NAS Alameda, Carl Vinson received the highest grade ever given to an aircraft carrier during an Operational Reactor Safeguard Examination. 1988: Carl Vinson departed NAS Alameda for its fourth deployment on June 15, 1988, and making another challenging and successful transit of the Bering Sea. The carrier completed 82 days on station in the North Arabian Sea. While on station, the Gold Eagle supported the escorting of American flagged tankers in the Arabian Gulf. Carl Vinson returned to NAS Alameda on Dec. 16. The carrier received its second Admiral Flatley Memorial Award for aviation safety. 1989: The carrier departed Alameda on Sept. 18 to participate in PACEX ’89, the largest peacetime naval exercise since World War II. Carl Vinson conducted operations in the icy waters of the Bering Sea, including operations inside the Aleutian Islands. In the following weeks, Carl Vinson, leading a battle force of three carrier battle groups, conducted operations in the Western Pacific Ocean and East Sea/Sea of Japan, and were joined by the navies of other nations. 1990: The ship departed on its fifth deployment on Feb. 1 for the Western Pacific and Indian Ocean. The carrier received its first COMNAVAIRPAC Battle "E" award for 1990. After returning to Alameda on July 3, the carrier steamed to Bremerton, Wash. in September to commence a complex overhaul at Puget Sound Naval Shipyard starting on Sept. 22, which would conclude on April 6, 1993. 1994: The carrier started its sixth deployment on Feb. 17 to the Western Pacific and Arabian Gulf in support of Operation Southern Watch. The Commander-in-Chief, Pacific Fleet Change of Command was held on the carrier on Aug. 5 while at Pearl Harbor. Carl Vinson returned to Alameda on Aug. 17; and received its third Admiral Flatley Award for aviation safety. 1995: From Aug. 26 to Sept. 3, Carl Vinson participated in Exercise Ke Koa and the commemoration of the end of World War II in the Pacific. During the commemoration, President Bill Clinton visited the ship in Hawaii and 12 historic warplanes from World War II were launched from the flight deck. One month later, the ship returned to the San Francisco Bay area and participated in Fleet Week, ’95, launching World War II aircraft, an F/A-18 Hornet and F-14 Tomcat, and an unprecedented launch and recovery of an S-3 Viking in San Francisco Bay. The carrier received its second Meritorious Unit Commendation for the 50th Commemoration of VJ Day 1995. 1996: Carl Vinson departed May 14 for its seventh deployment to the Western Pacific and Arabian Gulf. The ship participated in Exercise Rugged Nautilus and Operations Desert Strike and Southern Watch before returning to Alameda Nov. 14. The carrier received its second Battle "E," its third Meritorious Unit Commendations and its fourth Admiral Flatley Award. 1997: On Jan. 17, Carl Vinson arrived at its new homeport, Bremerton. In February, the ship added another chapter in the history of naval aviation as the platform for the last carrier launches and recoveries of the A6-E Intruder. 1998: Following an intense work up period Carl Vinson participated in RIMPAC ’98. The carrier steamed from Bremerton in early Nov. for its eighth deployment to the Western Pacific and Persian Gulf. On Dec. 19, Carl Vinson launched air strikes in support of Operation Desert Fox, and continued support for Operation Southern Watch in enforcing the no-fly zone over southern Iraq. Vinson was awarded the Navy Unit Commendation Medal and was once again was awarded the Battle "E" for Efficiency. 1999: Carl Vinson maintained pressure on Iraq by launching several air strikes against selected targets located in the no-fly zone of southern Iraq in support of Operation Southern Watch from January to March. As a result Vinson was awarded the Meritorious Unit Commendation. In July, the ship entered Puget Sound Naval Shipyard for an 11-month Drydocked Planned Incremental Availability. The Navy spent more than $230 million for equipment upgrades, a new local-area network, new berthings, and several quality-of-life upgrades. 2000: Carl Vinson finished the overhaul period in June 2000 and began the pre-deployment phase of operations. The ship got underway for sea trials, TSTA, FEP, and COMPTUEX in the fall, operating off the coast of Southern California with Carrier Air Wing Eleven and other ships in the battle group. 2001: From January to June, the carrier spent most of the time out to sea preparing for the ship's twelfth deployment. Carl Vinson steamed out of Bremerton, Wash., on July 23, and after stopping to on load Carrier Air Wing Eleven at Naval Air Station, North Island, Calif., headed west. On Sept. 11, as our nation was rocked by the terrorist attacks, USS Carl Vinson was rounding the tip of India en route the Arabian Gulf to enforce the no-fly zone over Southern Iraq in support Operation Southern Watch. At that moment, the Gold Eagle changed course and headed to the North Arabian Sea, where our battle group would stand ready to answer the call of freedom. That call came, and on Oct. 7, 2001, just 36 hours after we welcomed our new commanding officer, CAPT Richard Wren, the Carl Vinson and her battle group launched the first strikes in support of Operation Enduring Freedom. For 72 days, we remained on station and together with Carrier Air Wing Eleven conducted more than 4,200 combat sorties in the War on Terrorism. In mid-December, Carl Vinson stood down the watch and headed home, visiting Singapore for Christmas. 2002: Carl Vinson returned from her historic deployment on Jan. 23. For their support of the nation's war on terrorism, the crew received the Battle "E" and also the Navy Unit Commendation medal. In April, the crew began a Planned Incremental Availability. During this time several new operational systems were installed, and the ship’s flight deck and catapults were completely renovated. Numerous other spaces and crew living areas were also entirely restored, drastically improving working and living conditions for the crew. Completing her maintenance / overhaul period in record-setting time, USS Carl Vinson and crew set sail in September to conduct sea trials and once again announced to their chain of command that they were ready for fleet operations. In mid-October, the aircraft carrier headed to sea and again set a new standard by completing a transformational innovative Inter Deployment Training Cycle (IDTC). By December, the Carl Vinson / Carrier Air Wing Nine team was deployment ready and was named the Pacific Fleet “ready carrier. ” 2003: The Carl Vinson-Carrier Air Wing 9 team wasted no time in answering the call of America. On Jan. 13, the strike group responded to the world’s need for a stabilizing presence in the Western Pacific by ensuring theater security in cooperation with friends and allies in the region. While underway, the Navy’s deployment schedule began shifting to implement a new Fleet Response Plan (FRP). The shift required Carl Vinson to extend its deployment two and one half months. After nearly nine months at sea, “America’s Favorite Aircraft Carrier” returned to Bremerton Sept. 19 to a hero’s welcome. During the final three months of 2003 the mighty “Gold Eagle” once again assumed the role of the West Coast’s ready carrier. 2004: In February, a meticulous inspection by the Navy’s Board of Inspection and Survey found the “Gold Eagle” fit to continue its third decade of service to the American people. The crew of Carl Vinson now faced the trifold challenge of preparing for their upcoming six-month deployment, readying their families for a change of homeport from Bremerton to Norfolk, Va., and planning for 2005’s Refueling and Complex Overhaul at Northrop Grumman Newport News Shipyard. 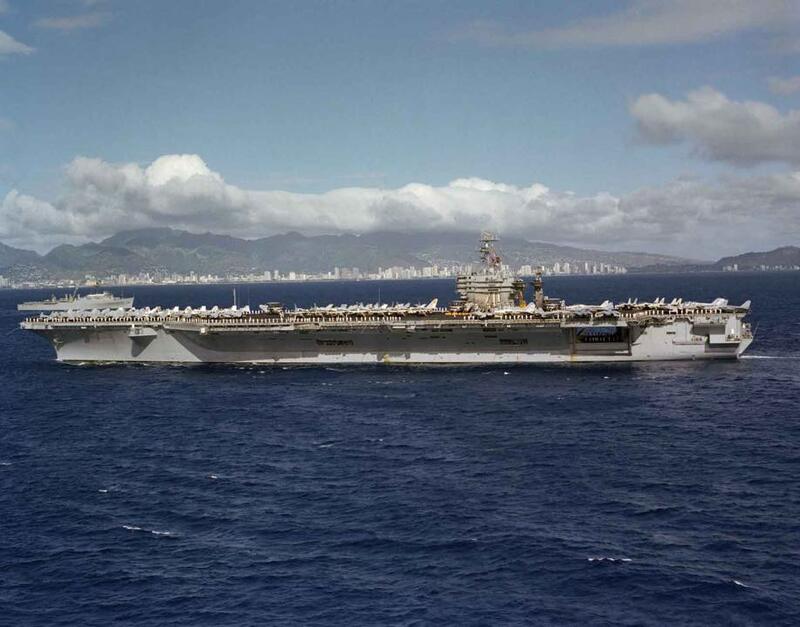 During RCOH, “America’s Favorite Carrier” will be completely refitted, and the nuclear fuel that powers the Nimitz-class carrier will be replenished. 2005: On Jan. 3, Carl Vinson began an historic around-the-world deployment, leaving behind Bremerton, Wash., its homeport of eight years. After completing Joint Task Force Exercise (JTFEX), Vinson began its journey west on Feb. 1. 2006: Carl Vinson continues to move forward with Refueling and Complex Overhaul, operating out of Dry Dock at the Northrop Grumman Newport News shipyard in Newport News, Va. In November, Carl Vinson’s crew and Northrop Grumman Newport News Shipyard employees completed the installation of the ship’s anchors and chain, adding more than 200 tons of weight to the ship. Simultaneously, its two 50-ton rudders were installed preparing the ship for its departure from the dry-dock period of its overhaul and move to a pier location within the shipyard. 2007: On Jan. 7, Carl Vinson’s project team completed the installation of four new propellers and the ship made final preparations to complete its dry-dock period. In May, near the mid-way point of RCOH, USS Carl Vinson moved from dry-dock to a newly constructed and specially designed pier located at the shipyard. During the pier portion of the overhaul, Team Carl Vinson continued installation and testing of equipment and groomed shipboard spaces in preparation for the crew’s move back aboard the ship, which will occur in 2008. 2008: USS Carl Vinson continued the final phases of its Refueling Complex Overhaul (RCOH) during 2008, accomplishing many key milestones and bringing the aircraft carrier one step closer to redelivery and a return to operational status. During the early months of 2008, Carl Vinson Sailors coordinated efforts with Northrop Grumman Shipbuilding employees to restore much of the ship’s infrastructure, including many key distributive services, workshops, berthing spaces, and main galley. In August 2008, Carl Vinson Sailors began living and working back on board the ship for the first time since the aircraft carrier began its overhaul at Northrop Grumman Shipbuilding in late 2005. As 2008 came to a close, the crew of USS Carl Vinson remained focused on completing their crew move aboard evolution and preparing for upcoming sea trials.